The science is clear: Eating the right foods can lead to a longer, healthier life. But some people find it harder to eat right as they get older for many reasons. Maybe they don’t have much of an appetite. Maybe they have trouble cooking or eating. Maybe they don’t know what’s healthy. Or maybe they do and just don’t like the idea of kale. “You know what? You can live a long, healthy life and never eat a piece of kale,” says Cheryl Rock, PhD, a professor of family medicine and public health at the University of California, San Diego School of Medicine. She’s all for finding healthy food that you like and building on that. “If you’re eating foods you like, then you’re more likely to stick with it. You won’t force it down for 4 days and then go out for a double cheeseburger,” Rock says. But it’s more than just finding the right foods. Michele Bellantoni, of the Johns Hopkins University School of Medicine, points out that you need to eat them in the right amounts, too. Many foods are especially good for certain parts of your body. Bellantoni suggests splitting those 1,800 calories up into proteins for your muscles, calcium for your bones, and a basic heart-healthy diet. That approach can do a lot of things for you. A basic heart-healthy diet can help you control your weight. That’s important because more than a third of people 65 and older are obese. That can lead to diabetes, some cancers, and heart disease. 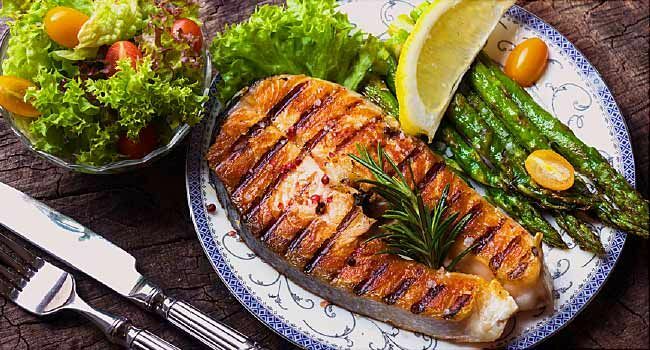 Salmon and other fish, like trout and herring, are high in omega-3 fatty acids, which help lower your chances of heart disease and may help with high blood pressure, among other things. Aim for two servings a week. The fiber in veggies and whole grains also can help make you less likely to have cardiovascular disease. And it aids with digestion and may help keep you regular, which can be a problem for some older adults. No single food is going to help your heart. You need a complete, healthy diet. Alzheimer’s disease has been linked to chronic inflammation, which can be caused by foods like white bread, french fries, red meat, sugary beverages, and margarine. Scientists are still studying the link between some foods and brain health. “I would not want to identify a specific food that prevents memory loss. I probably would tell someone that if you want to be functioning well, then some fruits and antioxidants will do better for you than another slice of cake," says Adam Drewnowski, PhD, director of the Nutritional Sciences Program at the University of Washington. Antioxidants, found in many vegetables and in fruits like blueberries, help ease inflammation. They also help you get rid of some damaging things called free radicals that are made when your body changes food into energy. Again, it’s important to realize that good brain health may be as much about what you don’t eat as what you do. Try to get tomatoes, blueberries, green leafy veggies like spinach and kale, turmeric, and nuts (especially walnuts) into your diet. And those omega-3 fatty acids, found in salmon and other oily fish, are inflammation fighters, too. They’re always breaking down and getting built back up again -- that’s the way your body works. As you get older, you need more protein for that rebuilding process. “If you don’t eat enough protein, you’ll be breaking down more than you’re rebuilding,” Rock says. Low-fat or fat-free yogurt, cheese, milk, lean meats, fish, other seafood, and beans can help with that. And eggs are an excellent source of protein, too, and they don’t have the saturated fats that meat have. Don’t worry about the cholesterol in your eggs, Rock says. Your body doesn’t absorb it well. Older adults need calcium because it boosts healthy bone growth. Yogurt, low-fat cheeses, and milk are good sources. You’ll want to be careful, though, because too much can cause constipation. Talk with your doctor or dietitian about what would be best for you. Getting enough vitamin D is important, too, because that helps your body use calcium. But that’s not always easy. “The risk for low vitamin D in older adults, that’s kind of a challenge because it’s not like there’s lots of foods that are high in vitamin D,” says Stephen Anton, PhD, from the department of aging and geriatric research at the University of Florida. Calcium and vitamin D are in fortified foods, fish like salmon, and dairy products. Adam Drewnowski, PhD, professor of epidemiology and director, nutritional sciences program, University of Washington. Michele Bellantoni, MD, associate professor, clinical director, division of geriatric medicine and gerontology, Johns Hopkins University School of Medicine; medical director, specialty hospital programs, Johns Hopkins Bayview Medical Center. Stephen Anton, PhD, associate professor, clinical research division chief, department of aging and geriatric research, department of clinical and health psychology, College of Public Health and Health Professions, College of Medicine, University of Florida. Cheryl Rock, PhD, registered dietitian, professor, department of family medicine and public health, Cancer Prevention and Control Program, University of California, San Diego, School of Medicine. Gomez-Pinilla, F. Nature Reviews Neuroscience, July 2008. Simopoulos, A. Journal of the American College of Nutrition, December 2002.